Dae-Hoon Lee: "I want to bring back excitement to Taekwondo"
The two time World and Asia Champion, Korean Dae-Hoon Lee, is aware of the loss of attraction and excitement that taekwondo has experienced in recent years and says he will fight to bring it back. Behind his peaceful appearance, there is a strong competitor whose mission is to win his second consecutive gold medal at the Asian Games and the firm intention to bring back the attraction and excitement to a sport criticized for being boring to the general public. Lee, who is preparing for the Asian Games to be held in the city of Incheon, from September 19 to October 4, said: “If I can be in my top physical conditions and I do not underestimate any rival, I think I should get my second gold medal” adding that his other goal is to entertain and motivate spectators. Many Taekwondo athletes compete with an excess of caution to protect the few points they can achieve, rather than trying to hit winning shots. For this reason, our sport is becoming less attractive at major sporting events and even its Olympic status achieved in 2000 is threatened. Dae-Hoon Lee, 22, said that South Korean fighters are now more familiar with electronic protectors, “some good athletes, who were not used to electronic protectors, lost their combats to athletes with a low technical quality but with experience with fighting with electronic protectors”. Lee confirmed that he and his teammates are now familiar with this technological innovation. Lee will compete to defend the Asian gold medal won four years ago in the 68kg category, after an unsuccessful attempt in the 58 kg category at the Olympic Games in London. Back then, Lee focused on losing weight to compete in a lighter category, however, such decision resulted in a loss of power and represented a handicap and he had to settle for the silver medal. 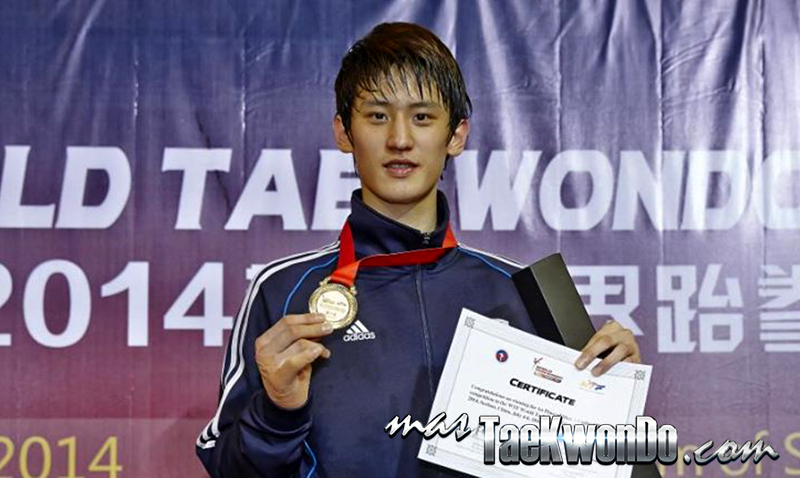 Remember that during the World Taekwondo Championships in Puebla 2013 in the Bantam -63 kg weight category, the young Korean, who already held the world title won in Gyeongju 2011, was simply a “steamroller” on Saturday July 20 at the Exhibitor Center Puebla, day in which he scored 89 points in his favor and 25 points against in his six fights.